We'll also focus on 1 Peter (after Easter), Genesis (summer), and Exodus (September) this year. This Sunday we'll finish up our sermon series on the Grace UMC Core Values with Missions. Speaking of Missions, a couple of years ago, Bishop Mike McKee urged all pastors and churches of the North Texas Conference to begin partnerships with local schools. It was a vision to get churches outside of themselves and place them in ministry in their local parish. Called "One + One," the goal is for all 300 North Texas churches to have at least 10% of the average Sunday morning worship attendance active in a school. So I signed up to be a mentor to a student at a local school in Plano. Every Monday I met with a 3rd grader during his lunch time. We would play games together-- usually Uno. It was fun, and required very little effort on my part. When I moved to Sherman last summer, I tried to settle on a school to become a reader or mentor to a local kid. It took a while, but I finally settled on Wakefield, where many other Grace folk already served, or had just begun to serve. Yesterday was my first day. I sat in the hallway for an hour, listening to 2nd graders read. Again: fun, with very little effort required. Over the last couple of weeks, Wakefield has popped up in unexpected conversations and occasions. Le Lange mentioned her work there. Ron Woodworth mentioned not only reading but as a Grace Trustee he's noticed some needs of the school. And it just so happens that our new Missions Board Chair, Sue Ann Spencer, lives in the immediate neighborhood around the school. She watches those kids walk past her house every day. I began to think and pray: how could Grace bless even more families at Wakefield? And could we change our outreach efforts to focus specifically there? I've spoken with Sue Ann, our Administrative Council, and a few others about the possibilities. Everyone has been very enthusiastic. I even mentioned deepening our relationship to Mrs Linson, the school principal. She is already very appreciative of our support of the school, and was very excited about the possibility of growing the relationship further. Grace can make a lasting impact on our community. Yesterday was my first day to read at Wakefield. Bigger things are coming! It's a blank slate for now, but I am calling the mission focus a Wakefield Blitz. The exciting thing about this effort is there will literally be an opportunity for everyone to participate, according to their individual gifts. For now, go to the Sherman ISD website and register as a volunteer at Wakefield. It's one hour a week. The kids are adorable. And as you stop in to read, or drive past on Sunset on your way to Dairy Queen, say a little prayer for the families of that school. And its future partnership with Grace. That all of us together may see and feel the presence of God in a new way in our neighborhood. 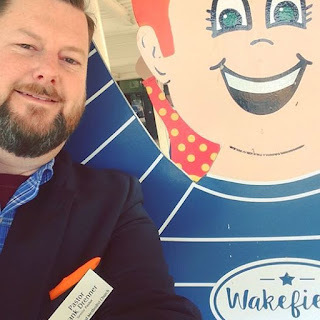 My husband and I both volunteer at Wakefield to read with second graders. Just walking through the halls, we feel the young energy, and appreciate the teachers who are dedicated to educating the next generation. I'm looking forward to participating in Grace's effort to make a difference in our hometown through partnership with Wakefield.